Does your toddler throw a tantrum or become really upset when they need to see the doctor? As upsetting as it can be, it’s actually not unusual at all for toddlers to develop a fear of going to the doctor. This is because they begin to remember what happens when they’re in the doctor’s office. Think about it from their point of view. All they know is when they go to the doctor they get prodded and injected and they have absolutely no idea why. They may remember what happens, but they don’t know why it happens. So, understandably they start to associate going to the doctor as a bad experience. Toddler’s don’t always have the verbal skills to say why they don’t like the doctor, so they do the only thing they can to express their feelings – cry or scream. The question is, how can you ease their fears and make it less traumatic for both them and you? As mentioned above, one of the main reasons toddler’s start to fear the doctor is because they don’t understand why they’re being prodded and examined. So, explaining why you’re taking them to the doctor can be a great way to prepare them for the experience. Of course, this isn’t going to help them get over the pain or shock of injections if they need them, but it will help them to understand more about what is happening. You can also talk about the things you’re going to do after the doctor visit, giving them something to look forward to. Then, if they start to get upset in the doctor’s office, remind them of what you’re doing afterwards. If they are getting injections, prepare them for it by letting them know, but don’t make it out to be a big deal. Instead, stick to the facts, that they may feel a little pinch but it will be over in a few seconds. If you act like it isn’t a big deal, your toddler won’t be as nervous. Even adults hate going to the doctor, so some level of fear is to be expected. However, if your toddler is overly fearful, it’s worth talking about it with the doctor. They will be used to dealing with fearful children. If they know your child is scared, they’re more likely to do things to ease your little one’s fears. They may be more patient, or offer toys or something to distract your toddler while they assess them. Just making them aware of the problem can make a massive difference. If you’ve tried everything but nothing seems to be easing your toddler’s fears, it could be the doctor themselves that’s the problem. Consider switching doctor’s and seeing whether it makes a difference. You don’t need to switch clinics, just ask to see a different doctor he next time your toddler is due to go. Just like adults, toddlers may prefer one doctor over another. So, give them the option of a different doctor and monitor their reaction. It’s common for parents to try to ease their toddlers fears by telling them things like “I promise it won’t hurt”. However, if you do tell them this and it turns out it does hurt, they’re going to have a hard time trusting you again. There’s also the possibility you’re putting pain into your child’s mind as they may not have even considered the possibility it might hurt. So, avoiding mentioning anything about pain is recommended! Toddlers can learn a lot about life and social situations through roleplay. Therefore, it’s a great idea to play out a doctor’s visit scenario. By using their favorite toys, you can go through what’s likely to happen at a doctor’s visit and see how they react. Give them medical equipment toys so they can play with them themselves and practice making their toys “better”. This will help build up doctors as a positive presence, there to help make people feel better. While it isn’t guaranteed roleplaying will stop your child being fearful of the doctor, in time it can help to reduce the fear. Although it’s difficult to pinpoint why, sometimes toddlers react much differently when somebody else takes them to the doctor. So, ask your partner or a family member to take them and see how they get on. It could be the simple fact that all of their negative doctor experiences have occurred while they are with you. So, having a different adult around could help break the negative association. Although bribery should definitely be limited, it can work wonders when it comes to doctor visits. Take something your child really likes and then give it to the doctor to give to your toddler. After a few visits, your toddler will start to associate going to the doctor with getting a positive reward. Ideally, the treat should be given at the end of the visit. However, if your toddler tends to scream right from the beginning, it’s often worth letting the doctor give them something there and then. Sometimes, the only solution is to remember that this fearful behavior will disappear in time. It’s extremely common for toddlers to hate going to the doctors. You can rest assured yours isn’t the only one who screams and cries from the minute they enter the waiting room! As frustrating, embarrassing and upsetting as it is, like many challenging behaviors, this too shall pass. 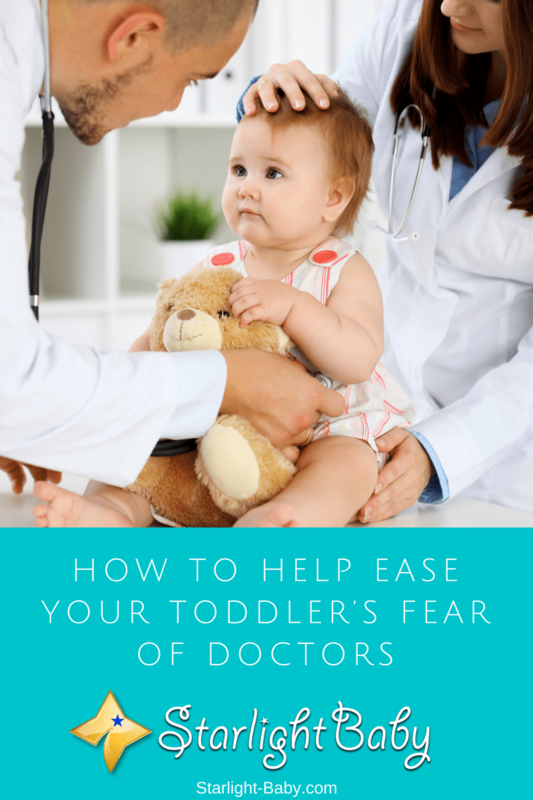 Overall, the above are some of the best, tried and tested methods to help ease a toddler’s fear of the doctor. Do you have any additional tips that worked for you? Do us all a favor and share them below! I love all the ideas you have presented here. I would only ad that as a parent and the insurance holder, you have a right to go and shop for a great doctor for your child. Don’t be afraid to go first and meet with the person you are choosing to take care of your pride and joy. if you get push back from anyone, well then you know you need to move on and try another. A great doctor will do what it takes because they love children. Great article and thank you for all the help. Good suggestion regarding paying the doctor a visit first, especially if one is planning to change doctors. A personal visit can give a parent insight into how a doctor treats his/her patients. Most pediatricians treat their patients kindly and do their best to befriend the kids to gain their trust. There are a lot of great tips here! Unfortunately, it is not always as easy as “just see another doctor” when you live in a less populated area. Personally this wouldn’t be an option for me. I don’t think I would be able to bring myself to let someone else take one of my kids to have shots, but I understand the reasoning behind it. The other tips all made me smile, as I’m sure I’ve used each of them. Prepping ahead of time is so important for kids, in almost anything you do that is new or out of routine. Even for things in routine, like giving 2 minute warnings before they must clean up or stop an activity. I have also found that the doctor’s kit toy set I purchased for my kids has been amazing for reducing doctor visit anxiety. They look forward to it now and the doctor always gets questions about what the various tools are for! Thanks for this! You’re right, LesMama. Buying the kids a doctor’s kit would help alleviate the anxiety/fear. It would, indeed, make them curious especially when they the doctor uses the apparatus they also have, like a stethoscope. I have a three months old child. During these three months, after being discharged from the maternity hospital, we have taken the baby twice to the doctor for a vaccination. When the baby got a vaccine shot for the first time, he was in pain for three days. My wife and I had sleepless nights. This was just a beginning to many vaccine shots that the baby will get for the first two years. The second shot was little easy. The next day the baby was normal. The baby is too young to recognize the doctor, therefore, he does not show tantrums until he gets shot, however, I understand, he will show tantrums when he begins to understand things. This article has a lot of good tips that I can use. Thank you very much. So true, vinaya. When babies are still at their first few months, they would not know what’s happening, so they will not associate the pain to the one who ‘inflicted’ it. It’s when they could already understand things that life becomes complicated, haha. Lobevly tips. I can say that I am very lucky because my toddler has never had any problems with going to the doctor because I explained him that it is really important. Also, my toddler likes to get help so doctors are for him. He might become a doctor one day, you never know. I was in a rush as my toddler was getting ready for sleep. Great to hear your toddler doesn’t have any problems going to the doctor. Unfortunately, some are not so lucky, that is why it’s important to explain to the child the reasons why one needs to visit the doctor. It’s good of you to that. Thanks for sharing 🙂 Best of luck to your future doctor! Great ideas, im sure when my baby girl becomes a toddler dr. trips will become an nightmare. Im glad I found this blog! Seems like every time she goes they want to stick her with needles. Oh! Poor little girl. It’s understandable why she has fear of going to the doctor. I hope this blog could really help her in overcoming her fear. We wish her the best of health! Well, before we even picked out the doctor for my boy, we did so much research about everything possible and we definitely got a good one. We are blessed because not once did our toddler express or showed any sort of fear – the doctor is extremely friendly and talkative. He even gives him some candy after the visit so he’s excited. I think that bribery is a good method because what child doesn’t love some reward or candy? Mine certainly does! Either way, deal with the fear right away. Don’t let it build up. Great tip there Jane regarding getting rid of the fear right away. I’m sure that would really help because things could only get worse if it’s not addressed right away. You’re right, bribery works every time, but the biggest plus would be a doctor like the one you have. I’m sure his patients are really lucky to have him, and happy whenever they visit him. Some doctors have the charisma for toddlers they are using visual stuff and they make them selves funny just to get the attention and to have relationship with the kids. It it a big help if the doctor has a real passion for kids. Like the movie ‘Miracles from Heaven’? The doctor on that movie is using a toy (elmo) so that the kid will not afraid to a man in white uniform with stethoscope. Great point there, jose — a children’s doctor should have “real passion for kids” as you’ve mentioned, otherwise, it will be difficult to build rapport with his/her patients. I always love pediatricians who treat my kids kindly, not like others who seem to be doing it just because it’s their job. As I always say to other parents when we talk about grumpy teachers or those who easily get mad at their students, they should not have worked as a teacher if they do not have the passion and patience for kids; they’re in the wrong profession. Same goes for pediatricians. As for using doctors as a way to discipline children, I guess I’m guilty of that sometimes. It’s a good thing none of my kids are afraid of the doctor, haha. It is quite funny that you just described me in this article and the fear I used to have while I was a toddler. That feeling was something I wouldn’t forget in a hurry, but one that always stood out then was that my parents were over caring in assuring me that the visit to the doctor is for my good and to make sure that I get better from a particular sickness. I used to have malaria then, as a result of mosquitoes that is in Nigeria, and that always involves getting medicated by our personal doctor. My mum communicating effectively with the little me then always went a long way in making the visit to hospitals one I should have many worries about. Also, each visit to the doctor always come with the after a reward of a biscuit and that always make me feel it is worth it to feel the pains and have my biscuits later. I wouldn’t mind using these tips on my kids if they develop fears of visiting the doctor when they are ill.
As a nurse, pediatric patients we have the most problem with are the toddlers. They’d kick, scream and bite whenever someone wearing white in the hospital would go near them because the’d automatically think that they’d be injected with something. What makes matters worse is when parents threaten their children with doctors or nurses hurting them with injections, whenever they do something unfavorable to them. This obviously makes our work harder than it should, and these kids would instinctively hate us. What I usually do in order for my toddler patients to like me is using that good old fashioned bribery, as you have said, and doing a little role playing before we do any procedures. They have worked like magic for me, and these seldom fail me, so I believe that doing these would be very helpful for parents. It’s also very important to never make unrealistic promises like saying “It doesn’t hurt”, because the kid would eventually realize that you lied, and may not trust you on matters like this. It is better to say that ,” It would hurt, but you’re a big and strong boy now so you can do it”. These tips are so true. I tried all of these with my daughter. Since she was also born premature, she needed to see the doctor almost every month. Role playing in the house also helped her overcame the fear of injections. We tried to explain to her also the benefits of all her vaccines. It also helped that she knew the doctor already and the place or the clinic is very kid-friendly. I remember right after each visit, the doctor or the nurse will always give her lollipops or some balloons. In our case, the reason why the toddler was not comfortable while visiting the doctor was because the doctor was entirely professional while checking our toddler. He didn’t even have a smile on his face during the checkup. The that was fear was always pretty serious during the doctors visit owing to the behavior of the doctor. We ended up switching doctors and the newer one is much more friendlier to not only our toddler but to all children in general. This is completely vanished the fear of doctors in our kid. So, yes indeed your point of changing the doctor worked in our case. This is a very serious issue for all children, it’s only few that aren’t afraid of the hospital alone less being with a doctor who gives them painful injection. The stinging of the niddle is very painful to any toodler out there, the scheme of giving them snack or toy bribe from the doctor won’t change the fact that they are still going to cry once given the injection. I would only say it’s only with time that they are going to get used to the injection and not cry again.